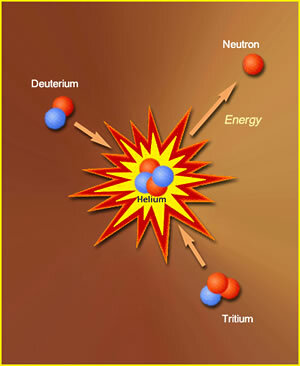 In one kind of fusion reaction, nuclei of the two isotopes of hydrogen, deuterium and tritium, are crushed together to form a nucleus of the heavier element helium. This reaction releases one neutronand a tremendous amount of energy. In 1956 a geophysicist named Marion King Hubbert announced a formula predicting that the rate at which oil could be extracted from the lower 48 states would peak around 1970, then begin a rapid decline. Hubbert's calculations were presented at a time when the U.S. was awash in "black gold," and Hubbert became a public laughingstock. Then his prediction came true. The Hubbert peak is no longer a laughing matter: calculations show that global oil production could reach the Hubbert peak within this decade. We need to find alternative energy sources soon. 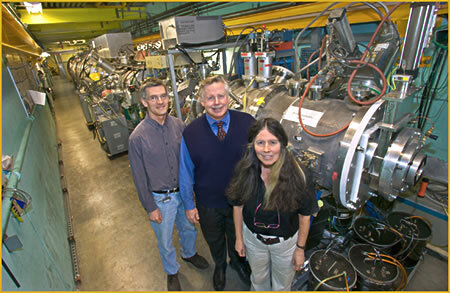 Towards this end, in 1999, after decades of individual institutional efforts, researchers with Lawrence Berkeley National Laboratory, Lawrence Livermore National Laboratory, and the Princeton Plasma Physics Laboratory formed the U.S. Heavy-Ion Fusion Virtual National Laboratory (HIF-VNL). This collaborative effort is now under the leadership of Grant Logan, a physicist with Berkeley Lab's Accelerator and Fusion Research Division. The goal of the HIF-VNL is to develop heavy ion accelerators capable of creating a fusion reaction by imploding tiny capsules of nuclear fuel. "We've completed three years of good research with results that are proving some of our most complicated concepts to be viable," says physicist Christine Celata of the Accelerator and Fusion Research Division. A long-time contributor to the Lab's heavy-ion fusion program, Celata was invited to speak on the latest developments in HIF research at the annual meeting of the American Physical Society in Denver, May 1-4, 2004, the second year in a row that APS invited her to give a talk. "Even the magnetic-fusion research community has recognized the value of pursuing an alternative approach," she says. "As a bonus, the experiments for heavy-ion fusion also yield valuable information on accelerators for future research in particle physics." Fusion is the energy source that ignites the sun and every other star in the universe. Controlled fusion reactions on Earth would provide a virtually inexhaustible, safe, and clean source of energy. 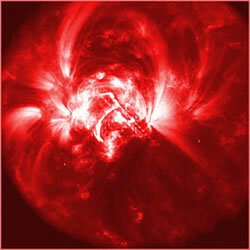 Fusion is the energy source that lights up the stars. It takes place when lighter atomic nuclei are fused together to form heavier nuclei. A typical fusion reaction releases roughly one million times the energy released by the burning of oil. Among the selling points of fusion are its safetyunlike nuclear fission, fusion cannot sustain an uncontrolled chain reactionand its environmental cleanliness. Unlike the burning of fossil fuels, a fusion reaction does not contribute to global warming. But the biggest selling point of fusion as an energy source is that it would last forever. A fusion power plant would be fueled by deuterium and tritium, the two isotopes of hydrogen. Both can be obtained from seawater. Deuterium is extracted directly through hydrolysis and tritium is bred from the element lithium, dissolved in seawater and also abundant in the earth's crust. If used for fusion, enough water to supply a year's worth of electrical power to a city like San Francisco could be delivered in a pickup truck. In an HIF reactor, an imploded pea-sized capsule of nuclear fuel burns quickly enough to keep it confined by its own inertia. This confinement lasts long enough for the reaction to produce energy. The implosion that ignites the fuel is set off or driven by high-powered beams of heavy ions such as xenon, mercury, or cesium, which are focused on the capsule. 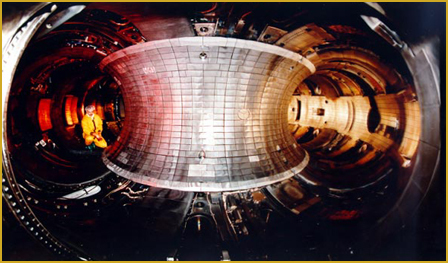 HIF could offer several advantages over magnetic fusionincluding the elimination of the "first wall" problem. Scientists seek ways to avert the constant neutron bombardment that makes a tokamak's walls highly radioactive. "It's estimated that within three years of steady neutron bombardment, a tokamak reactor's walls would have to be replaced, and several tons of highly radioactive material would have to be disposed of," says Celata. In HIF, on the other hand, reactor walls can be shielded from neutrons by a liquid called FLiBe, a salt of fluorine, lithium, and beryllium. Heavy ion beams can be directed to pass through crossed jets of FLiBe like a spray of water passing through the face of a tennis racket. FLiBe not only protects reactor walls from neutrons but also from the pressure waves and debris discharged during the fusion reaction. Furthermore, the released neutrons can actually interact with the FLiBe to breed more tritium for fusion. "We expect the use of FLiBe will protect the walls of an HIF reactor for about 30 years," says Celata. "Vapor from the FLiBe will also act to neutralize our ion beams and help with the focusing." While the technologies behind an HIF and a high-energy particle physics accelerator are similar, there are still formidable challenges to be met, including the transporting and focusing of heavy ion beams whose total current might rise to 500,000 amperes by the time they reach the target. At such a high current, space-charge forcesthe mutual repulsion between so many positively charged ionsbecome a serious impediment. The accepted solution is to simultaneously bombard a fuel capsule with the combined energies of a multiple number of independently focused, lower current beams. Experiments in the 1980s and 1990s at Berkeley Lab demonstrated the potential of the multiple beam approach but left questions unanswered. The latest HIF-VNL experiments are helping to fill in the blanks. Determining optimum beam size and the best means of preserving beam quality during transport are the goals of the High Current Experiment (HCX) being carried out at Berkeley Lab. The HCX consists of an ion injector plus 10 electrostatic and four magnetic quadrupole magnets. "The HCX is the first transport experiment using a driver-scale heavy ion beam," says Celata. "It allows us to test aperture limits, electron and gas effects, halo formation, and steering. This information is crucial for designing future experiments and HIF drivers that will minimize the size and cost of multiple beam arrays." The Neutralized Transport Experiment (NTX), also based at Berkeley Lab, is designed to investigate beam physics in the final focusing system and during neutralization. Beam neutralization for the final run at the target counteracts space-charge forces and enables the beam's energy to be focused to a smaller spot. Consisting of a 400-kiloelectron volt (keV) injector, four magnetic quadrupoles, and two plasma sources for neutralization, the NTX has already been used to demonstrate dramatic reductions in beam spot size. "A 25 milliamp beam at 255 keV transported through a tube 7.6 centimeters in diameter was focused to a 14.7 millimeter radius when non-neutralized," says Celata. "This same beam, when neutralized, was focused to a radius of only 1.26 millimeters." A third major HIF-VNL experiment, being carried out at Livermore, is testing the concept of an injector that merges 119 small beamlets, each with a radius of about one millimeter, into a single intense heavy ion beam. Computer simulations so far indicate that the concept of merging beamlets offers technical advantages over single beam injectors, Celata says. For example, merging beamlets would reduce the transverse dimension of the injector for each of the multiple heavy ion driver beams by a factor of more than two. Preliminary experiments have also shown that high quality beamlets can be made through the use of a plasma source. After these three tests are concluded, probably within a couple of years, the next step in the HIF-VNL program calls for the Integrated Beam Experiment (IBX). This experiment will enable HIF-VNL researchers to follow at least one beam from injection through acceleration, longitudinal drift-compression, neutralization, and final focus, with sufficient beam current to observe interactions with the background gas or with secondary electrons. "The IBX might last from five to eight years, and after that we'd be ready for the Integrated Research Experiment, which would test all the components and physics needed for a commercial HIF reactor," says Celata. "I'm optimistic about our chances for success."